In addition to the gasholder I would need: a retort house, exhauster, boiler house, condenser, scrubber, washer, purifier bins, a tar tank, meter house and general office. As I am very mean, my usual method is to find something in my collection of bits that can be recycled. The retort house is a Metcalfe factory with a cornflakes box coal hoist shaft clad in Scalescenes corrugated iron. 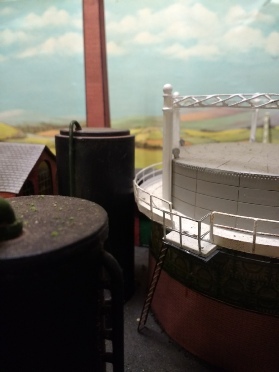 Buildings from the brewery kit form the exhauster building, pump house and base of the tar tank (topped by a Wills water tank). 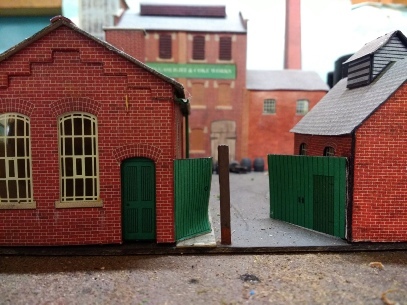 The boiler house comes from the small factory building kit. 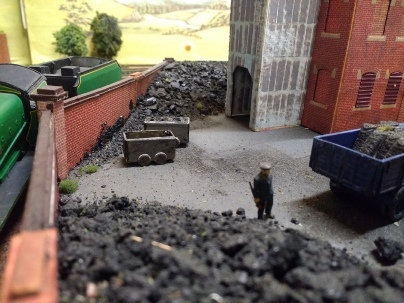 Coal and coke ready for use in the gasworks. Gas is made by heating coal in the retort house which drives gas out and leaves coke. The gas is pumped away by the exhauster into the condenser which cools the gas. A view of the condenser, scrubber and gas holder. In the condenser water was pumped through tubes to cool the gas. The scrubber was filled with coke and sprayed with water to remove the larger "particulates" or bits of coke, tar and dust which were suspended in the gas. The pressure produced by the exhauster pumps the gas through all the other equipment and pumps up the gas holders. The condenser, scrubber and washer started life in the plumbing section of B&Q with a few bits of Plastruct and Knightwing pipes and sprue.